Yes, another Ambeth Ocampo post. This time, it's about the Philippine's first National Artist Fernando Amorsolo in Ambeth's lecture titled "Fernando Amorsolo: Portrait of the Artist as Historian". I have to admit, I only know Amorsolo by name. I did not know much else about him, but after the lecture, I had a newfound respect for his talent. Ambeth began his lecture by stating that "History is not always written by historians" and that "There is always more than one version of the story". The Battle of Mactan, for example, is commemorated by two shrines. In the first one, the emphasis was on Lapu-Lapu defeating Magellan and becoming the first Filipino to repel European aggression. Meanwhile, in the second one, the emphasis was on Magellan's journey and the first circumnavigation of the Earth. Heck, even Yoyoy Villame has his own version of the battle. Ambeth argues that "History is too important to be left to historians" and that history can be recorded by artists but may not always be accurate. Going back to Lapu-Lapu as example, we don't really know what he looked like but we have a mental image: handsome, regal, masculine guy with six-pack abs, when it would have been more realistic that Lapu-Lapu was short and squat. Where did we all get that mental image of a dashing hero? From paintings and sculptures, the artists' visions. Now enters Fernando Amorsolo and how he made and recorded history..
One thing about Amorsolo is that he was so prolific and so popular. He was all over the place, like a one-man art movement, and very much in demand. He did not just paint portraits, nudes, historical paintings, and scenery, he was also a very busy commercial artist. He did posters, ads, book illustrations, even comics. His influence in the pop culture of the time is undeniable. Amorsolo loved painting people, especially women. He painted nudes as well as scenes of everyday life. His slice-of-life paintings stand out due to their brightness and vivid colors. He presented idealized moments -- with perfect weather and people hard at work, but the people look happy, contented, and fresh. His subjects do not look tired, disheveled or sweaty. It was as if Amorsolo looked at the world with rose-colored glasses. During World War II, Amorsolo continued painting and sketching the things he saw around him. The difference between his paintings before and during the war is very pronounced. In place of the brightness, the positivity, and the vibrant colors, his wartime paintings and sketches are grim and have depressing undertones. Instead of smiling and working contentedly, the women are running, afraid for their lives and for their children. Amorsolo captured the terror, tragedy, and the hardship during the war and immortalized them in his medium. The contrast between the pre-war and the wartime paintings gave us an ideal, a romantic period we refer to as Pistaym (Peace Time). 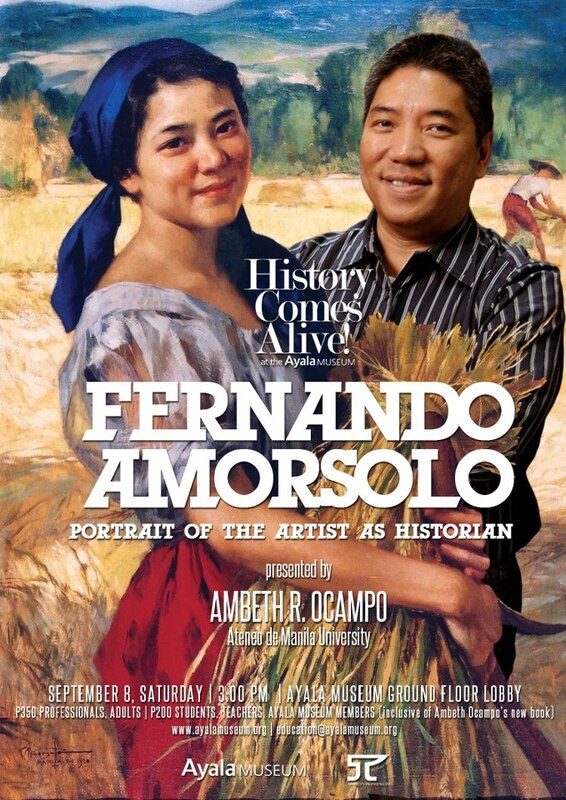 Fernando Amorsolo also helped shape the image of the ideal Filipina. "[The women I paint should have] a rounded face, not of the oval type often presented to us in newspapers and magazine illustrations. The eyes should be exceptionally lively, not the dreamy, sleepy type that characterizes the Mongolian. The nose should be of the blunt form but firm and strongly marked. … So the ideal Filipina beauty should not necessarily be white complexioned, nor of the dark brown color of the typical Malayan, but of the clear skin or fresh colored type which we often witness when we met a blushing girl." Just like Ambeth Ocampo's previous lectures, this one was attended by a lot of people. Entrance fee was P350 (P200 for students, teachers, and Ayala Museum members), with a complimentary copy of his book Prehistoric Philippines.